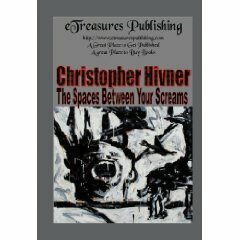 Paul Collins: Today we have Christopher Hivner introducing his short story collection “The Spaces between Your Screams”. I haven’t read this book myself, but Christopher Hivner was kind enough to agree to do an interview about his book to any readers who might be interested in the subject. Christopher, how would you describe your collection to your prospective readers? Christopher: This is a book of what you could call bite-size stories. Packed into the pages are 39 short horror stories, long enough to satisfy your blood lust but short enough that you can read a couple before going to bed at night or enjoy them in the morning while eating your bowl of Cap’n Crunch. There’s something for everyone in the book as it explores many different aspects of the horror genre. There are traditional monsters like vampires, werewolves and deranged humans, but there are also new, weird and wonderful creatures I thought up during my many fever dreams. The styles are varied as well. Some are psychological, others are visceral and a few use dark humor. Paul Collins: What themes does your collection explore and what do you hope the reader will take away from the experience? Is there a particular feeling or experience that you hope to evoke in the reader? Essentially, what do you hope your collection will mean to a reader? Christopher: First and foremost I want to make you squirm. You should be thinking twice about whether you want to turn to the next page or even read the next word. I want you to question why you ever opened my book. More than that, I want you to curse me for ever taking pen to paper. When you finish reading “The Spaces between Your Screams” you should be a shell of your former self willing to trade your plasma for a good night’s sleep. Paul Collins: What prompted you to write this collection and did you have a specific inspiration in mind? Were you influenced by a certain author or work that inspired you to add your voice to this genre? What motivated you to write this book? Christopher: Like many other horror writers I was influenced by Stephen King. I read Salem’s Lot when I was in 7th grade and it filled my head with all sorts of things that shouldn’t have been there. I had always enjoyed writing stories so now my work was filled with nasty people doing strange things and vice versa. The stories in “The Spaces between Your Screams” were written over a period of seven or eight years. I decided to organize them into a book to try and take that next step as a writer. Paul Collins: If you could compare your book to any other existing works, which ones would it be and why? If the one thing you could say to a prospective reader was, "If you like X, you’ll love my book!” which work would be invoked so that a reader could judge whether or not your collection is their cup of tea? Christopher: My favorite short story collection again belongs to Stephen King. “Night Shift” was his first collection of short stories and I loved it. It was very influential to me as far as how I structured my stories and how I came up with ideas. The stories in “Night Shift” were also relatively short and sweet, unlike his later volumes where he wrote a lot more novella-length stories. I believe if you’ve read “Night Shift” you could read “The Spaces between Your Screams” and enjoy yourself. Christopher: This is my only published fiction collection. I have also had two poetry chapbooks published. I have two other collections of horror stories about half finished and I am working on a horror novel. Paul Collins: Where can readers obtain a copy of your collection for them to enjoy? How can they contact you with any thoughts or questions? And do you have a means by which they can "sign up" to be notified when your next novel comes available? Thanks for joining us for an interview. Looking forward to reading your book! All the best! Have You Noticed How All The Models Are Wearing Their Bodysuits?